A video trailer showcasing Pantera’s Home Video Four has been released. The clip appeared as a surprise on the band’s social media channels and shows footage of them backstage, at signing sessions and having fun between shows. There’s no word of a released date yet, with Pantera’s last home video, 3: Watch It Go, released on VHS back in 1997. It, along with the other two home videos: Cowboys From Hell: The Videos and Vulgar Video, subsequently appeared on the DVD package 3 Vulgar Videos From Hell. Pantera would arm their road crew with handheld cameras and allow them to film them as they went out on the road, bucking the trend for big budget concert videos and documentaries. Last year, bassist Rex Brown reported that the surviving members of Pantera had been offered “ten times” the amount of cash Misfits made for their 2016 Riot Fest appearances to play together again. Rumours about a live reunion have been swirling for years, with Zakk Wylde potentially taking the place of late guitarist Dimebag Darrell Abbott. 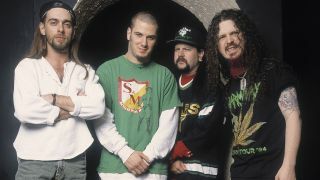 However, drummer Vinnie Paul Abbott has consistently said a reunion is out of the question after Dimebag was shot dead on stage in 2004 while playing with Damageplan.